Guests flock to the Jamaica getaway of Montego Bay because of just how bright blue the waters are and how sandy and white the beaches are. They love knowing that they can kick back on the beach with a fruity and tropical beach and that they can then hit up a local club or bar and dance the night away. Guests flock to the Jamaica getaway of Montego Bay because of just how bright blue the waters are and how sandy and white the beaches are. They love knowing that they can kick back on the beach with a fruity and tropical beach and that they can then hit up a local club or bar and dance the night away. Anchor Listing Villa offers some of the best timeshares in this tropical getaway for travelers of all types. 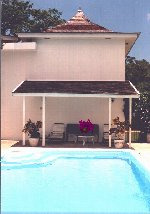 The Montego Bay timeshare resales available on the market from Anchor Listing Villa will sleep four or more. This fabulous, privately-owned villa can accommodate two adult couples looking to get away from it all, but these timeshares are also suitable for you, your spouse and your children. Though the villa comes with two bedrooms that each sleep two people, two more people can sleep on the pull-out sofa in the living room. With 2.5 bathrooms, you won't fight over the shower or sink either. Your villa will also come with a private patio, radio, television and a kitchen with lots of larger and smaller appliances. As an added bonus, you can pick the length of your stay as well as your check in and check out times. This villa has a large swimming pool outside with its own patio that lets you overlook Montego Bay while either in or out of the water. You can make healthy meals in your unit or enjoy one of the meals prepared by staff daily that utilize fresh ingredients. Telescopes are available for guests who want to star gaze, and a sundeck lets you relax while you enjoy the fresh air. Anchor Listing Villa has an airport shuttle that departs daily to pick guests up and drop them off. You can also request babysitters and private drivers you can hire for sightseeing during your trip. When looking at options for an upcoming trip to Jamaica, make these Montego Bay timeshare resales the first ones you look at and consider for your family. Contact Anchor Listing Villa Specialist Today!